Cute and convenient for skiing at Crystal. This is a cute cabin with lots of beds. It’s a 30 minute drive to Crystal, and we enjoyed staying here. The kitchen is a little sparse, but this was a great base camp for our trip. The house was clean, easy to use and housed 6 of us and two dogs comfortably. Only 30 minutes to the Mountain made for a relaxed morning and leisurely evening. My husband and I along with our 3 grown children (2 with spouses) had 3 great days of skiing while staying Wayne's great Base Camp cabin. While the cabin is not huge, it was super comfortable for our family of 7. It was great to have only a 20 minute drive to the mountain versus the 2+ hour drive needed from our home in Seattle. Huge plus was one of the best "Crystal" ski days ever on Christmas Eve--Fresh tracks off Morning Glory!!! Wayne was super helpful when we had questions. Would definitely come back!!! 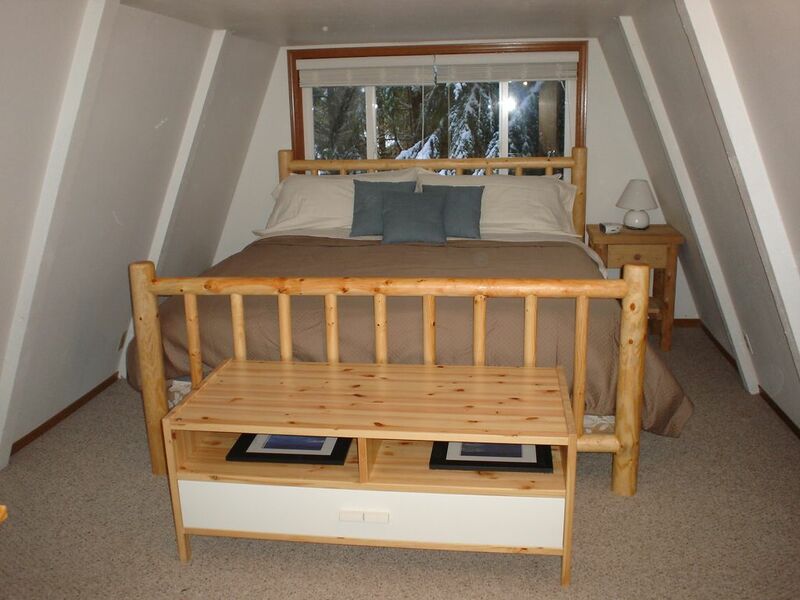 This cabin is the perfect place to stay for a ski vacation at Crystal or a quiet getaway at Mount Rainier. As others have said, the cabin is rustic, but we thought that only added to its charm. It is just as advertised/pictured, well in fact, it is much more adorable in person than the photos show. Plenty of places to sleep and the beds/linens were so comfy. The cabin was clean and well appointed with everything we needed. Owners were friendly and quick to respond. The neighborhood is so quiet, peaceful, and private. SO much better and cheaper than staying at the base of Crystal. The only "con" I would say about this place is it may not be the best choice if you have toddlers as there is a hot fireplace in the living room and a steep spiral staircase. For older children, however, it is awesome because of the lofts with ladders and many games/movies provided. Overall perfect stay and we would love to visit here again. Family from the east coast was in town, and we were looking for a place close to Mt. Rainier that would serve as our "base camp" for the weekend. This A-Frame worked well. Plus, we wanted a place we could bring our dogs, and the owner allows pets. A bit cramped for 5 adults and two dogs, but it worked. This place also would be great for skiers and/or families with a bunch of kids. Well equipped kitchen, comfortable beds. Situé dans la communauté privée Crystal River Ranch, le Elk Run Chalet est à environ 25 minutes de Crystal Mountain Ski Resort et l'entrée de White River / Lever de Mount Rainier. En hiver, Crystal est la montagne de choix pour le ski et le snowboard. En été, prendre le téléphérique pour une vue époustouflante sur le mont Rainier et un repas mémorable au Sommet House Restaurant. Lever de soleil à Mount Rainier a grande randonnée et des paysages étonnants. Autres espaces extérieurs à explorer comprennent Chinook et Cayuse Pass. Pour les vététistes, une sélection de choix de pistes avancées connues comme Skookum Appartements, Suntop, Ranger Creek, Palisades, Corral Pass, et Northway Trail Crystal Mountain sont accessibles au printemps grâce à la fin de l'automne. Le Elk Run Chalet est également situé à quelques miles à l'est de la ville de Greenwater. Greenwater vaut une visite. Baisse au Wapiti Woolies pour un café de Starbuck et parcourir leurs supports de vêtements de ski et chapeaux tricotés. La Naches Tavern est place de la section locale pour une bière et un hamburger. Le petit magasin général est là que vous pouvez ramasser des petits objets que vous avez oublié d'emballer et dispose d'une station d'essence. Greenwater Skis accueillera des démonstrations et grande tuning de ski. Autres activités saisonnières dans la région incluent le VTT, la randonnée, le golf à 30 minutes, routes panoramiques, pêche, équitation, chasse, golf frisbee, et la motoneige. Cancellation policy - At least 14 days notice, prior to the date of arrival, is required for a full refund of reservation.